In the Great Wars, Kiron Surehand was the member of the 5th Imperial Archers. It was a famous company, well known for their skills, toughness and loyalty. Kiron was especially talented, as he was the heir of a hunter dynasty so it is said that he was born with a bow in his tiny hands. During the Great Wars, the stocky, well-built and extremely fast archer was placed in charge with twenty of his comrades to defend a bridge until the King can withdraw from what later became known as the Battle of the Three Arrows. The charging of the combined forces of orcs and wargs was met with a furious volley of arrows. Four times they attacked and four times they had been defeated, and not only the King could reach a safehouse but the enemy was defeated. At the last charge of the riders, Kiron and his two surviving comrades, Lethan One-Eye and Hald the Fearless put one arrow each in the left eye of the orc commander. Seeing the devilish skills of the archers, the attacking forces retreated in awe and they had been destroyed to the last by the 1st Imperial Rangers. 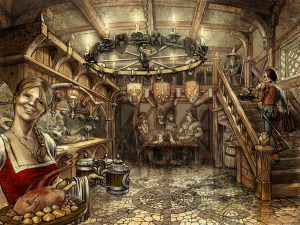 Kiron, Lethan and Hald was knighted there and then, and after their honorable discharge from the 5th, they received an inn as a token of gratitude from the King which they instantly named the Three Arrows Inn. Now, 20 years later Kiron Surehand is the only member of the trio alive. The Three Arrows Inn is the gathering place of adventurers, bards, soldiers and everybody who likes a good story about heroism, chivalry and honor. Kiron is known to sit down with adventurers and listen to their story, and if it is very good, he even surprises them with a gift from time to time. A Bookmark is esentially a savegame feature in the game. Whenever you feel it would be good to insert a virtual bookmark into your book, you only need to tap the green bookmark icon at the bottom left of the screen. You will need to create an account first, as bookmarks are saved into the cloud. If you change your device for example, you will only have to login with the same account on your new phone/tablet and you can go to any of your bookmarks. To access your bookmarks, tap “Menu” at the bottom right corner and tap “Jump to Bookmarks”. If you are logged in, you’ll see the list of all your bookmarks.